Travel to the cultural triangle, Sigiriya where you will stay three nights. Explore Sri Lanka's ancient kingdoms – The Lion Rock of Sigiriya and Dambulla’s Buddhist Cave Temples – all UNESCO protected World Heritage Sites. Upon arriving in Sri Lanka, transfer to the hotel in Negombo. Visit the coastal town of Negombo with its sun-kissed beaches, water sports, catamarans and fishing villages. Experience Negombo’s ancient Portuguese-period Catholic churches or take a boat ride along its ancient Dutch Canals. Explore the Muthurajawella wetlands. Travel to the Cultural Triangle, Sigiriya where you will stay three nights. Explore Sri Lanka's ancient kingdoms – the lion rock of Sigiriya and Dambulla’s Buddhist Cave Temples – all UNESCO protected World Heritage Sites. We also recommend a visit to the ancient kingdom of Polonnaruwa, a royal medieval capital. After visiting Polannaruwa Museum, which will provide an overview of this ancient city and its heritage, walk round the ruins themselves. Visit the Minneriya National Park, where elephants gather around the lake. Experience the most thrilling safari experiences in Sri Lanka, elephant back ride, is not just a ride on the largest animal in Sri Lanka, it's an unforgettable experience where clients get to interact with the as well as enjoy a ride through wilderness areas and beautiful scenery. The village experience begins with a ride on a bullock cart, once famous mode of transport of royalty. Through lush greenery and wilderness next you will be canoeing in a reservoir, with life jackets. A visit to a house in the village, to experience the authentic rural life of Sri Lanka, to taste home cooked traditional food, for no extra charge. The village tour ends by a tuk tuk ride brining you to the world of modernization. Overnight stay at Amaya Lake superior room on BB basis. The journey from the cultural triangle to Sri Lanka's hill capital, the small lakeside city of Kandy, will occupy most of the morning. Experience the ancient Kandyan heritage. Visit the Temple of the Tooth in Kandy where a sacred tooth relic of the Lord Buddha is enshrined since 4th Century A.D. The temple has decorative walls, a golden roof and fine woodwork. Religious services (pooja) with traditional music and drumming are held daily at dawn, midday and in the evening where guests can participate. After wards witness the cultural show and roam around the city. Visit Pinnawala Elephant Orphanage, a remarkable project that protects the island’s abandoned or orphaned wild elephants that would otherwise have surely died. From small, modest origins it has grown into one of Sri Lanka’s most famous attractions. Pinnewala enthralls adults and children alike. Roaming free within the Sanctuary, except when occasionally shepherded by their Mahouts (keepers). The elephants’ highlight is their regular bathing sessions. The sight of herds of elephants splashing and playing in a river has charmed countless visitors. 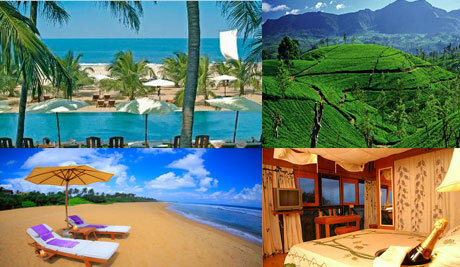 Sri Lanka is world renowned for its valued spices and healing herbs. Visit lush spice and herbal gardens feature many important herbs such as Sandalwood, Margosa, Cocoa, Citronella, Almond, Jasmine and Coconut. Begin your journey to the central highlands with its tea covered hills, gushing waterfalls, and scenic beauty by 1st class observation train. Travel into Sri Lanka’s tea-growing highlands and a two-night stay . The following morning you might like to enjoy the “Tea experience”, which involves a visit a plantation to observe firsthand the process, starting from the plucking field where it all begins with the picking of “two leaves and a bud” to the factory where the processing begins. A number of treks and scenic walks are also available, including the famous pilgrimage site, Sri Pada, known as Adam’s Peak, which is a conical mountain 7,360 feet above sea level. This mountain is a pilgrimage site to thousands of devotees from many faiths. The climb is best attempted at night where you reach the mountaintop to see the sunrise and the awe-inspiring view from the top. It can be one of the most moving experiences in Sri Lanka. Arrive for a late lunch, followed by an afternoon game drive. After a rewarding day, retire to your room while the sounds of the jungles lull you to sleep. Next morning guests can opt for a dawn game drive. Discuss your wildlife interests before hand and whether it is birds, leopards or elephants to personalize your game drives and take you on routes where you are more liely to see your favorite animals. Pamper yourself at a beach hotel. Swim in either the large pool or (at safe times of year) on the secluded stretch of tropical beach. Mini-courses are offered on such diverse subjects as Sri Lankan cooking and mask making. Optional - Discover Galle Fort with Juliet Coombe, Author, photographer, historian, and chef. Drive to Colombo, the city which draws together all the colors and cultures that make up this island nation, condenses them into a patchwork of markets, gardens and buildings both humble and grand, and knocks them against a narrow slab of beachfront. Discover the city and shop for branded clothes, jewelry and many more and dine at a beach restaurant. Check out from hotel and drive to the airport. 15 night’s accommodation on twin - sharing basis BB basis at all hotels. Airconditioned car and English-speaking driver for tour and transfers. Entrance Fees: Sigirya Rock Fortress, Dambulla Cave Temple, Temple of the Tooth, Pinnawala Elephant Orphanage, Polonnaruwa. Elephant back ride and village experience. Entrance fees and jeep hires in Yala and Minneriya. 1st class observation train tickets. The rights to use cameras or video at sites where most places they are free when you pay the entrance fees except at Kandy Tooth Temple & Pinnawela Elephant Orphanage there are extra charges for video around USD 05 per person. Medical expenses, insurance, international flights. The process is not complicated if you have any difficulty we could make arrangements for same too in 48hrs to obtain same if details are provided to us by mail. The process is very simple payments can be paid online & with the confirmation document print out & code you have to submit passport on arrival only. The passport has to be valid for six months from the day of arrival, return air tickets & sufficient funds or reservations for the holiday should be with you. All have to obtain a visit visa except for Singapore & Maldivian passport holders. On certain periods special room rates or compulsory meals are applicable in certain hotels, therefore these rates are subjected to change, during those periods. e.g : Christmas week, New year week or New year eve, during month of April, at Kandy procession period. Please note that this is a proposal only, not an agreement.